Apple Stock takes a beat down on report of lagging cell phone sales in China…. Apple Computer is having a rough time folks…. The annual new iPhone roll out this year was a bust…. The company WAS a computer company …. Now it gets most of its revenue from phones that have camera’s and computers in them and watches that tell time and have computers in them…. The company has not upgraded its desktop computers for almost a decade…. Of course Apple IS an American multinational company and there IS Trump’s tariff war going on with China…. 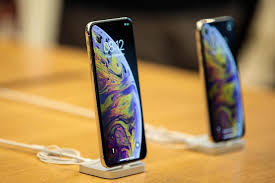 Apple warned Wednesday that revenue from its holiday quarter will fall short of prior estimates, a rare occurrence for the iPhone maker. Why it matters: Apple is one of the world’s biggest companies and a significant driver of the tech economy. The company said it now expects revenue of around $84 billion, down from a prior estimate of between $89 billion and $93 billion. Shares fall: Apple’s stock tumbled once after-hours trading resumed after a brief halt. Shares changed hands recently at $146.10, down $11.82 or nearly 7.5%. In a letter to investors, CEO Tim Cook blamed slow iPhone sales in China for the shortfall. Cook added that the trade war between the U.S. and China exacerbated the weakening economy there, and that he hasn’t seen any signs Apple has been targeted by the Chinese government. The context: There had been hints of weak iPhone demand for weeks, with a number of reports of suppliers and contract manufacturers cutting production plans. Yet similar reports have also appeared after strong launch quarters, too…..
AAPL shares are currently trading above the $157 mark on the intraday market, recouping virtually all losses incurred since Apple CEO Tim Cook slashed Apple’s revenue guidance by up to $9 billion for the first quarter of its 2019 fiscal year….